Screen Time for Kids? What are Pros and Cons? Think about the evolution of the human race — from nomads wandering the savannah to crowds of people standing or walking around while looking at tiny screens in their hands! I know everyone is asking the question: What are we coming to? What is the next step in our evolution. Whatever it is, it is something we shape ourselves! I am sure we cannot stop the march of technology, but as conscious beings we will learn how to use it for expansion not contraction! However, what about kids? Their brains are developing in stages. If directed incorrectly, lasting adverse traits and habits can develop. We need to be aware of these influences! First of all, toddlers up to age 2 or so need lots of activity to learn body coordination and hands-on learning. They are learning how a three-dimensional world works. They need lots of human interaction to understand how others are experiencing their own completely-fascinating universes. 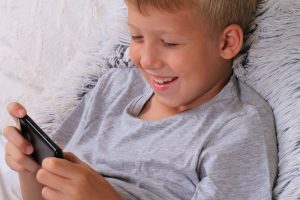 UCLA’s Children’sDigital Media Center has done a study published in 2014 showing that young kids exposed to too much smartphones or tablets end up deficient in social development and reading the emotions of others. At this age, toddlers should be involved with screens (including TV) only while interacting directly with a parent talking about what is important and how to understand context. Books are valuable because the parent is reading them interactively; same is true of screens. As kids get older, appropriate screen time becomes more complicated. Young children can gain a lot from exciting and challenging learning games. There are many of these on the market these days. Sesame Street created a similar idea for TV. Sesame Street has been proven to enhance learning, even though it is a very passive activity. Smartphones and tablets at least provide a little more activity and interactivity — reward feedback for successful understanding, for example. Even considering learning value, the American Academy of Pediatrics recommends only two hours of screen time a day for young children. Even learning on screens inhibits physical and social activity. This leads to obesity, diabetes, appetite control, and even attention span. It can alter sleep patterns, leading to sleep deprivation. These same factors continue for older kids and teenagers. Social interaction can be enhanced via Skype and messaging, but such activity continues to interfere with sleep and inhibits physical activity. The AAP recommends having wise conversations and negotiations as kids grow older. This new technological revolution is making changes to us all, so taking a thoughtful approach is crucial. And parents need to remember that they are role models, which is the most profound way we teach our kids. As with all things in health, moderation is the rule! I am very excited to have just discovered your posts. What great explanations for some common problem areas that parents deal with. Can’t wait to check out your website.